It’s my most favorite part of a sweater. The torso. Nothing like knitting skein after skein of plain ol’ stockinet stitch with no end in sight. I’m definitely not bored or anything. Definitely not letting Grandma’s sweater sit, neglected in a box on the floor of my studio. Nope. Definitely not doing that. 1. Casting on/neck/upper shoulders: Exciting! I just started on a new project, and I’ve only got a handful of stitches to a row. I’m flying along! 2. Lower shoulders: Sure, I’ve increased up to a couple hundred stitches, so any one row is a pain, but I get to work some cool colorwork. 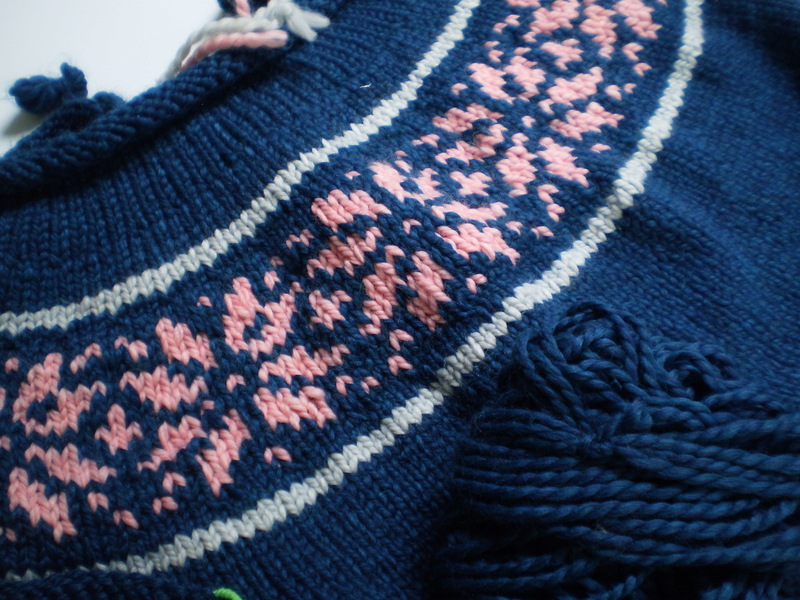 It’s still pretty fun, and the added fair isle keeps it interesting. 3. Split for arms: I get do do some math, and even break out the stitch holders. Excitement abounds! 4. Body: The worst. Really, pattern? You want me to knit 12 inches of stockinet over 200 stitches? No. I will set fire to the sweater instead. 5. Bottom ribbing: Hallelujah! I am just so happy to be knitting something other than the body! 6. First arm: Woo Hoo! Look how fast I can knit when I only have 70 stitches to work per row! It’s practically flying off my needles! 7. Second arm: Didn’t I already do this? Hurmph. I think I might get bored, but at least If I finish this step, I’m almost done! I can power through. 8. Collar and button band: Aren’t I finished already? I’m pretty sure I should be finished. Oh well, I guess I’ve got to keep going. 9. Finishing: Yeah! Nearly there! Maybe I if I don’t go to bed until 2:00, I can get this finished in time to wear it to work tomorrow? That’s acceptable, right? So, wish me luck, cheer me on, and hopefully I’ll get past Step 4. I’ve still got a looong way to go (and I have to make it before Christmas)! This entry was posted in FYI and tagged body, boredom, cardigan, knit, knit sweater, knitting, stockinet, sweater, top-down on November 24, 2014 by onemilljellybeans. I know, what’s up with that 2 sleeve thing. Is it really necessary?!! Love the stranded work, and the lovely contrast of colors. I know, right?! We need to start a fashion trend of one-sleeved sweaters. OMG, right?! There’s ALWAYS that sloooooooow section in the middle of ANY project! I just finished a 5-foot-long scarf of Celtic cables that was a 16-row repeat; I literally had to MAKE myself knit some days! But now it’s done, it’s beautiful, and 3 projects later, I’m flying through stockinette stitch because it’s not cabling every 2 stitches! Hang tough! You can do it! Oh. my. god. That sounds like torture. I’m getting ready to start another sweater (because why not) that will be mostly worked a knit/purl texture. I’m already cursing myself.